Nearest I can get is Camellia Japonica. Can any body help with the variety. Thanks in advance. 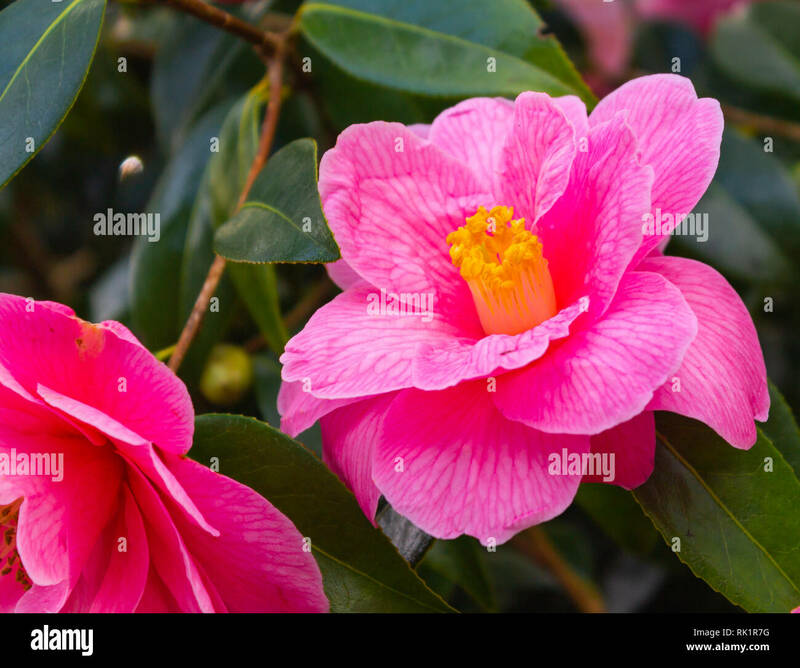 A large rounded camellia with large pink flowers. If not it might give you something to go on. Thanks Janet there are hundreds of similar looking varieties to me. Its a good start, looking at yours there are 2 overlapping petals counting out from the centre my image has three. Thanks again. Not 'St Ewe'. That's a single flowered variety (currently in full flower in my garden). x williamsii for sure, the veining on the petals often shows up in this cross and may be inherited from the Camellia saluenensis parent. I'd say it was 'Donation' - just coming into full flower in my garden or, possibly, 'Inspiration' - but that's not as common outside specialist collections. Thanks John its in full flower now and very common over here in Ireland, where thankfully the frost holds off most winters. Your plant expertise is always gratefully welcome. I had one in my garden in Nottingham and never saw it flower fully without frost damage. Glad I could help. Camellias are one of my personal favourites. I grow a few myself, we grow a good many at The Garden House, and the National collection is just over the Tamar at Mt Edgcumbe. They thrive down here! I know it well having spent a lot of time in Lympstone and Plymouth. Apparently a guy down there is growing tea which is related to camellia I believe, know idea what it tastes like. Yes, Camellia sinensis provides the young shoots that the Tregothnan estate near Falmouth uses to make authentic English tea. I've not tasted it - I don't drink much tea - but it's apparently very good (and expensive). C.sinensis would do well over in Ireland - it's a wonder nobody has tried it yet.